A sweet young woman rest in peace Officer Hickey. Your honesty and integrity will be protected by God's loving grace. A life cut short. You'll will be a heroine to be forever revered. For nineteen years I've looked at your picture every day. You are not forgotten! I read your memory in the paper. She is greatly missed. I have been were she is now. She is at peace. I am praying for you all during this time. Tiffany, we keep you in our thoughts constantly. It’s a tough time out here right now. Thanks for having our backs. You would be 39 years old today. Happy birthday in heaven. I miss you so much and it comes in waves of how hard it is sometimes, there's been a recent big wave of really missing you. It's your birthday today and you're overwhelmingly missed. We celebrate you today, celebrate your life, the life and joy you brought to others, the miracle you were, the lives you protected and served and the lives you touched and continue to touch. Love you with a never ending love. While I did not know you to well, I had a few classes with Chad. I met your father briefly at the Ride for the Fallen in 2013. My wife and I had bought a new Harley at Cowboy Harley Davidson the day before so I parked a little further away from the crowd. 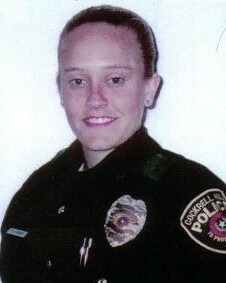 I remember looking at your dad's bike and seeing a beautiful picture of an angel carrying an officer to Heaven. As I looked around, I saw a sticker with your name on it and I told my wife I knew who you were. At about that time, your dad walked up and we started talking and he told me who he was. He was very nice. My wife and two kids are planning on attending the Ride in a couple of weeks. I hope to see your dad and talk to him again. My son will ride with me for the first time in an organized ride. He's very excited! I am now an FTO with my department. On the day of the Ride, I will be thinking about you and all of our other brother's and sister's in blue who have made the ultimate sacrifice. Our job is getting harder by the day but we do it because we love it. It’s been a while since I’ve dropped by to say hi but I think about you daily. Miss you lots. I know you're watching over all of us. You along with Chad and your parents are always in my thoughts. Until we see each other again. Thinking of you today, and always. I love you so much sweet angel. Tif, tomorrow evening we will be there again with your family to honor your life. Each time the deep heartache is almost overwhelming. Each time my heart breaks again for your Mom and Dad and Chad. You are missed so much. Your light was so bright, your smile so big and beautiful. I remember how very much you wanted to be a p.o. and how much you loved it for the short time that you were. We all still miss you so very much. Police Memorial Week has just ended and you will not be forgotten. Miss you Tiff. We'll never forget you. We've got it from here. Fourteen years ago today.....seems like yesterday and forever all rolled into one. you are missed so much and your legacy continues. It's been a while since I've stopped in here, it's also been a while since I have visited your gravesite, but that doesn't mean you are ever far from my thoughts. As a matter of fact, Pagoda St. no longer exists in Cockrell Hill. We renamed it Tiffany St., after you! I hope that's okay. I think of you every day when I pass the intersection, a block from home, and look up to see your name on the street sign. I gave your mom and dad a street sign to take home too! You were recently joined by a former Cockrell Hill City Council member and Fire Chief, J.W. Trevathan. I know you will get along well with him, he is a hoot! He used to live on Penrod while you were here. H's son is with you too, along with many Cockrell Hill residents over the years. I dare not try to list them for fear of leaving someone out. But I will mention Cora Hernandez, because I know you would remember her. She's the elderly lady we took the fire truck to so she could see the lights up close. I remember how happy it made her, She was giddy with joy, like a child. Sadly, her dementia progressed over the years until she could no longer be cared for at home. Next month we will once again have a Memorial Ceremony in front of City Hall in your honor, sadly it's the only time I get to see your mom and dad and Chad and his family. His babies are growing too fast!!! I am very proud of all of them, they have turned their grief into such positive attitude and are helping so many others! I know you are proud of them too!!! It's so hard to believe that it's been so long since you were taken from this life. Dad came to join you this year, so I hope that he has bumped into you so he can tell you about everything that has happened. Who knows maybe you guys can even ref a game of soccer or two together. My heart skips a beat every time I see a post, I assume by the family, that concerns this young officer. The family keeps the memory alive and love just pours forth. I'm just a stranger but I too remember the accident. Officer Hickey, another birthday has passed ( wish I was only 34), I thought of you as well as my old partner Monday. I know he still hurts. Another birthday of yours has come and gone. Just a note to remind you and your family, you are still remembered and thought of. Happy 34th! My FTO took me by your flowers last week. I know that you are watching over us from the heavens above.